BRUNSWICK - Roger B. Maheux, 90, of Brunswick, passed away Jan. 10, 2019, at Maine Medical Center in Portland, surrounded by his loving family. 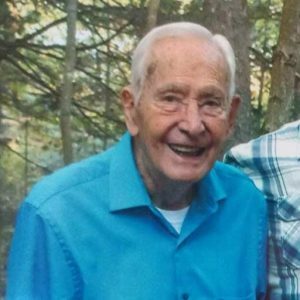 BRUNSWICK – Roger B. Maheux, 90, of Brunswick, passed away Jan. 10, 2019, at Maine Medical Center in Portland, surrounded by his loving family. Born on June 25, 1928, he was the son of the late Alfred and Desneiges (Fortin) Maheux and was born and raised in Lewiston, along with his older brother, Roland. He was a devoted husband to the late Irene (Couture) Maheux for 67 years and is survived by his daughters Arlene Simpson and her husband Robert of Brunswick, Sandra Certo and her husband Franco of Scarborough, Suzanne Cordoba of Gray, and son Michael Maheux of Turner. He was the most amazing Pepere to his nine grandchildren, 13 great-grandchildren and one great- great-grandchild as well as “Uncle Zeke” to his many nieces and nephews. He attended school in Lewiston and played High school football. After high school he enlisted in the U.S. Army where he was a lifeguard and rifleman. Once honorably discharged, he worked at various factories in the Lewiston area before taking a position at General Electric where he later retired after 22 years. He loved spending time with family and friends. In his earlier years he enjoyed camping, bowling, golfing, making his home brew, spending time in Old Orchard Beach with friends and being a member of the Knights of Columbus. He loved to watch sports and cheer on the Patriots, Red Sox, Bruins and Celtics. He also enjoyed watching the history channel, doing crossword puzzles, going to Casinos, doing scratch offs, reading novels and indulging in sweets. In his last year of life, he was able to leave Maine and spend a couple of months in Florida as well as travel to Las Vegas, Nev. on vacation. He even had a surprise Patriots themed 90th birthday celebration where he got to see all of his family and friends from near and far. Roger was a kind hearted, friendly, loyal and humble man who will be remembered for his devotion to his family, his faith in God, his positive attitude in any given situation, his selflessness, his unconditional love for all and his ability to light up the room and make everyone around him laugh and smile with his sense of humor. He was everyone’s friend and everyone’s Pepere. He touched many lives and will never be forgotten. The family would like to thank the staff at Maine Medical Center who cared for and supported him in his final days.